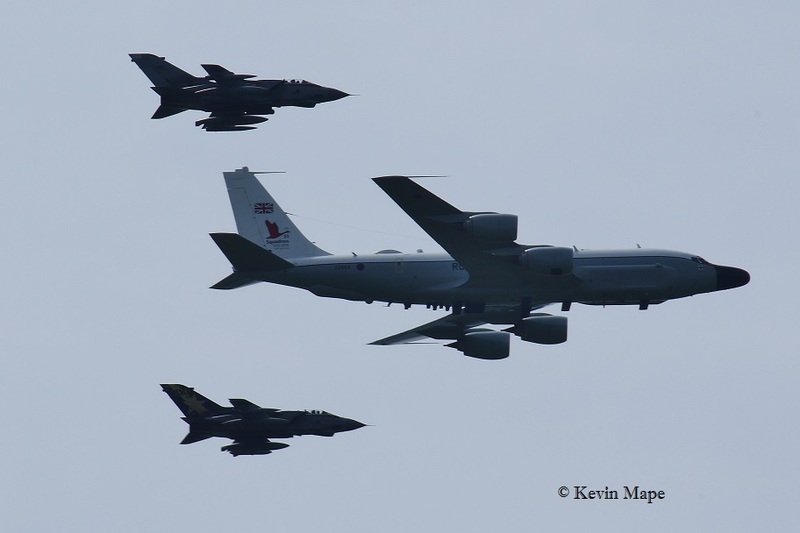 June and with RIAT just a few weeks away I am looking forward to seeing my first F-35’s, At Coningsby Sqn marks are still being removed as aircraft filter through the TMF. 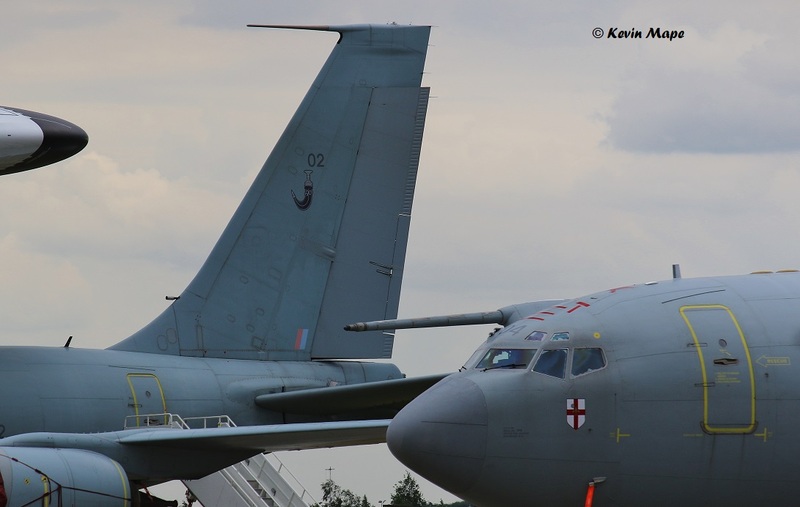 The first Typhoon FGR4 ZJ932/DB & ZJ936/QO-C have now left to go into storage with more to follow. 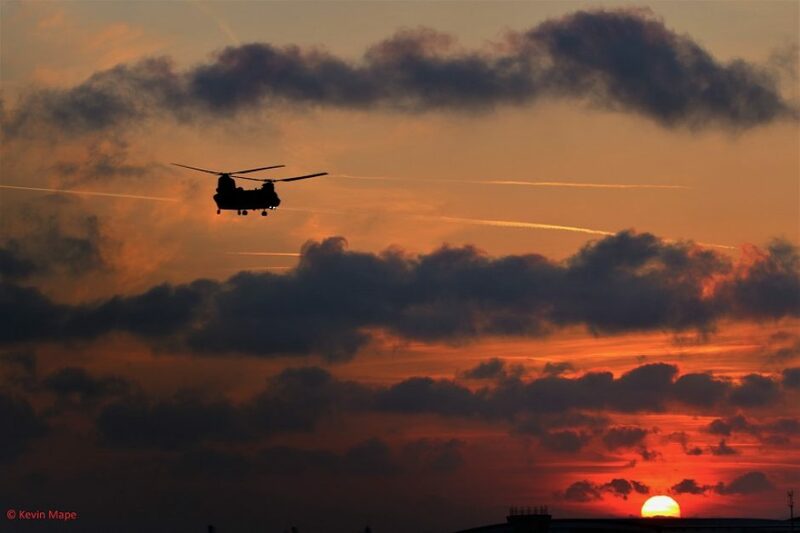 The first two weeks are due to have night flying. June may bring the long awaited first flight of the Lancaster this year after all the problems with the recoating of fuel tanks. The Lancaster is the icon of the BBMF, local people listen for the first flight of the year. 1st Wed Log thanks to Garf. Weather – Cloudy with showers and strong wind. AM – Runway 25 in use. 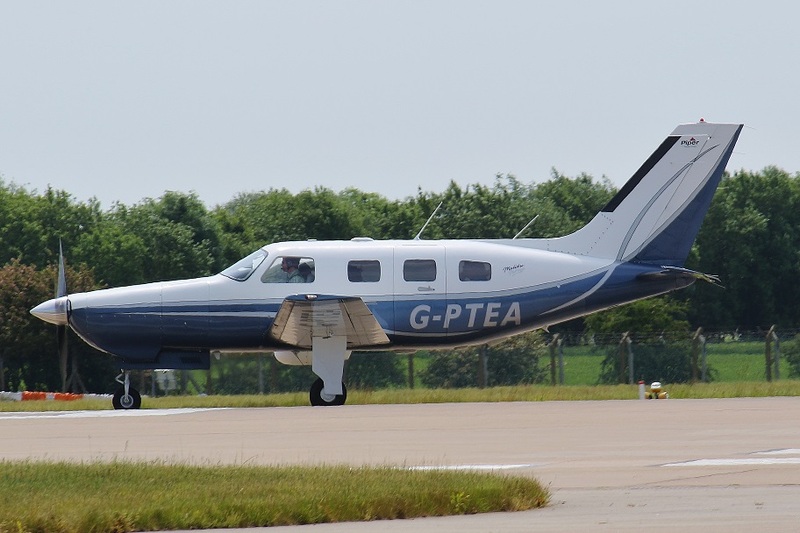 G-MAJH/JH/Eastern/Jetstream 41 c/s “East flt 101” – in “102”- out. 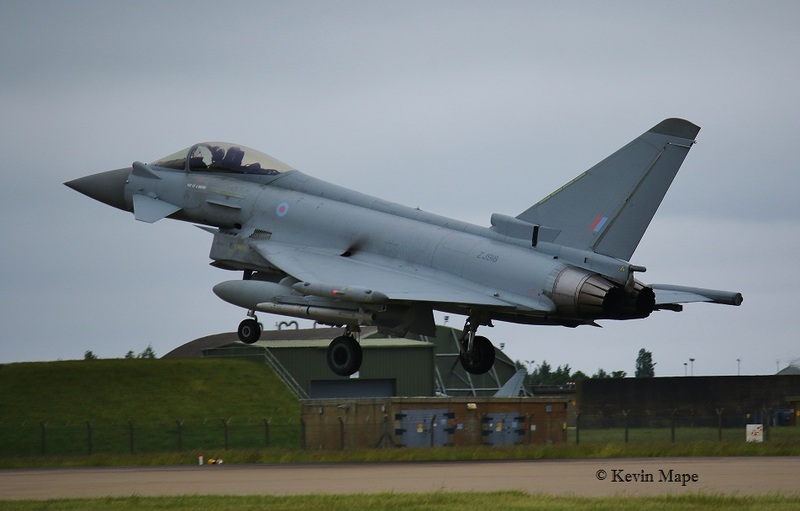 ZK381/EX/6Sqn/Typhoon T3 – Taxy test run. G-MAJH/JH/Eastern/Jetstream 41 c/s “East flt 105” – in “106”- out. G-MAJH/JH/Eastern/Jetstream 41 c/s “East flt 102” in “103” out. 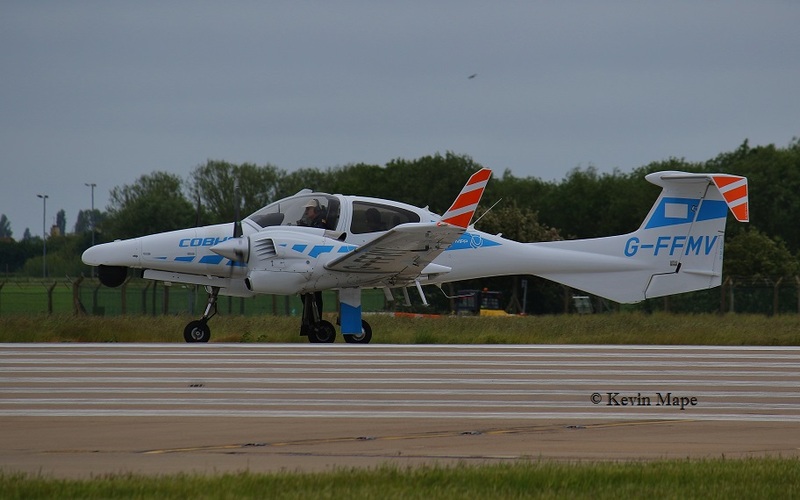 G-FFMV/Cobham /Da42 Twin Star c/s “Calibrator ***” – Departed. G-MAJH/JH/Eastern/Jetstream 41 c/s “East flt 104” in “105” out. 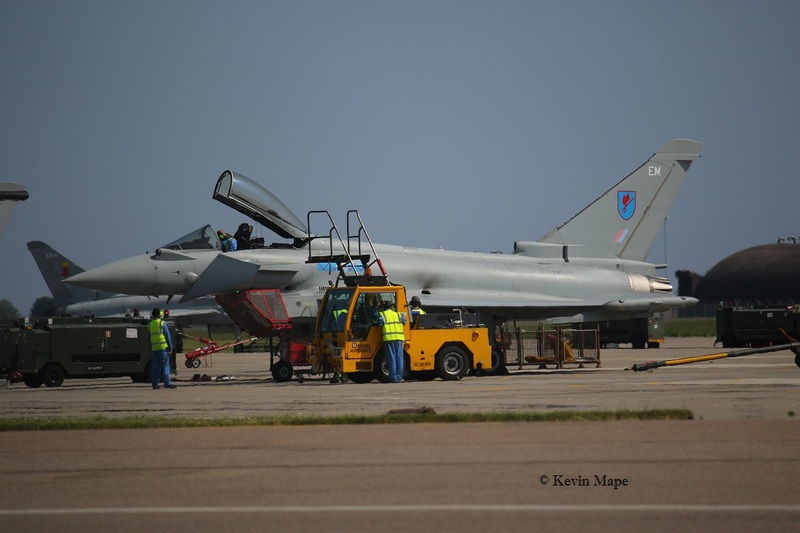 ZK302/EC/6Sqn/Typhoon FGR4 – Towed to the TMF. 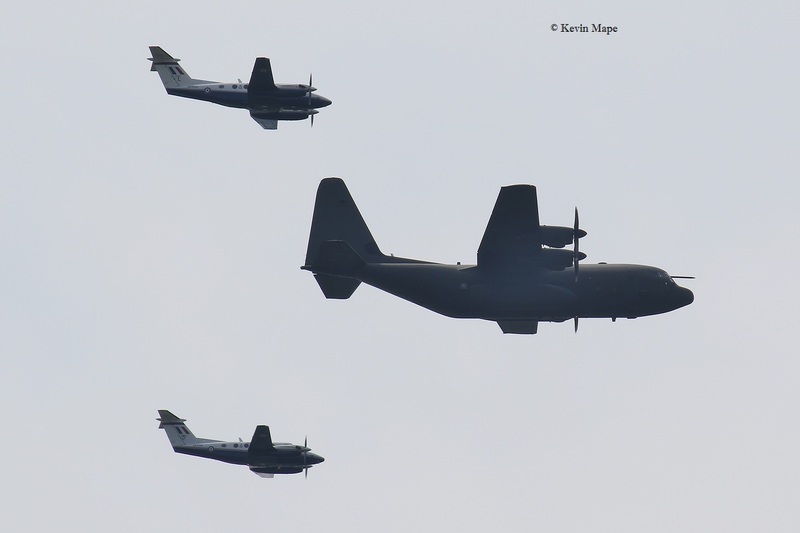 ZF264/264/1FTS/Tucano T1 c/s “Lima 11” – High overshoot. 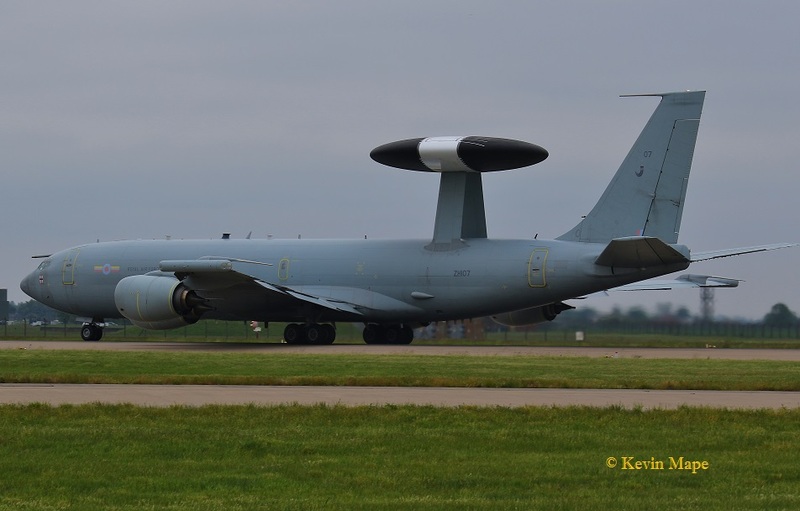 ZH101/01/8Sqn/Sentry AEW1 c/s “NATO 37” – Departed. 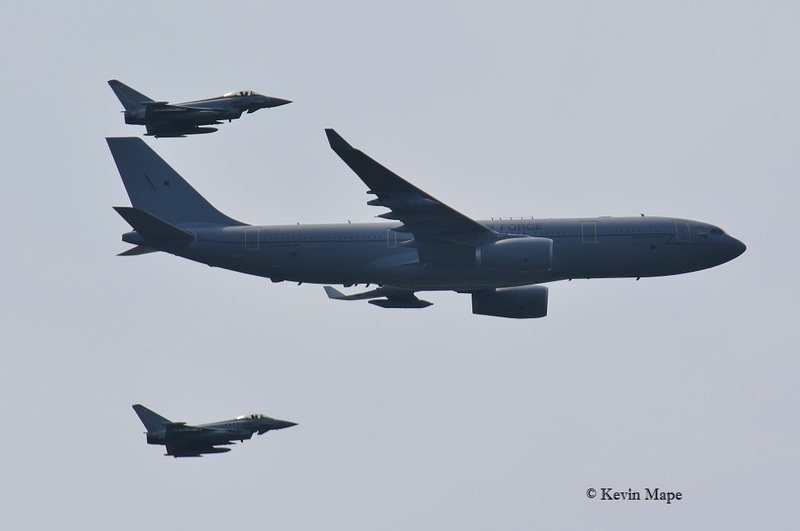 ZK305/EE/6Sqn/Typhoon FGR4 – Towed from TMF to the ASP. 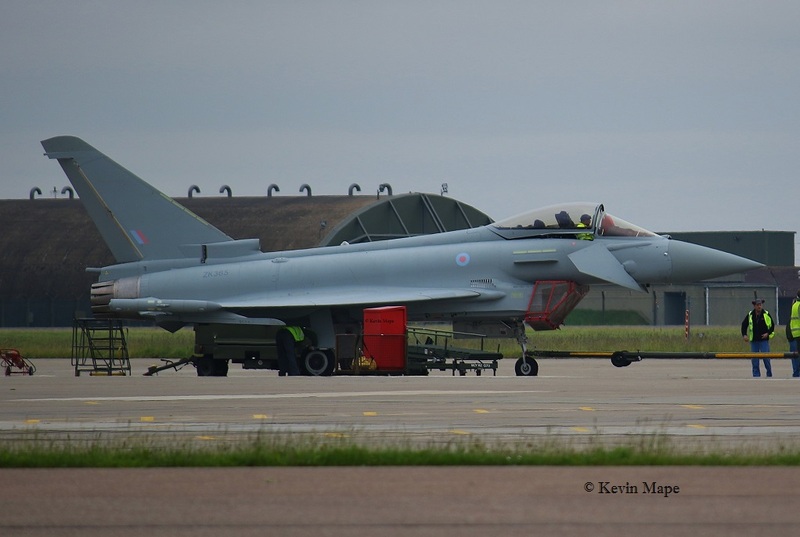 ZK345/EP/6Sqn/Typhoon FGR4 – Towed from the ASP to TMF. 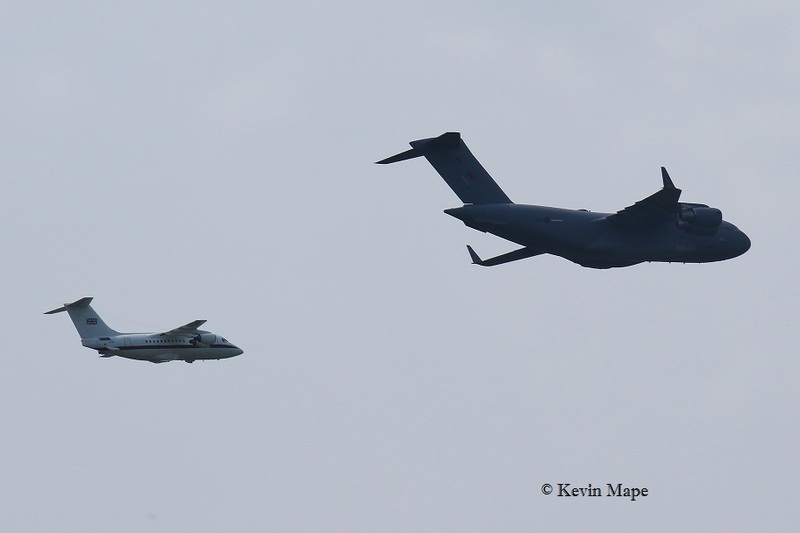 1 pm – Queens Birthday flypast practice at Cranwell list thanks to Kev Barwell. “Zircon 4” – ground abort. DZ – QRA radio check. DT – QRA radio check. ZF339/339/72(R)Sqn/Tucano T1 c/s “Lop 04” – Departed. 8th Wed Log thanks to Rich. Noted on the Wash pan – ZJ814/BH,ZJ801/BJ. ZK307/Unmarked/Typhoon FGR4 c/s “Zenith 11”- f/f without marks. 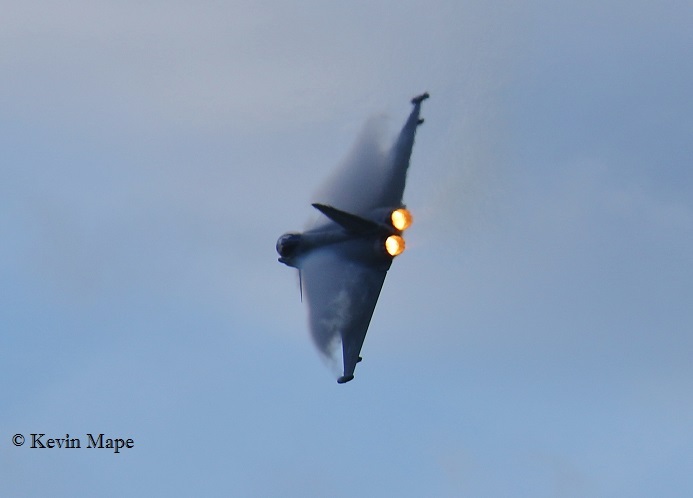 ZJ919/DC/XI(F)Sqn/Typhoon FGR4 c/s “Razor 12” – Ground abort. XX310/RAFAT/Hawk T1 c/s “Red 3” – Overshoot. 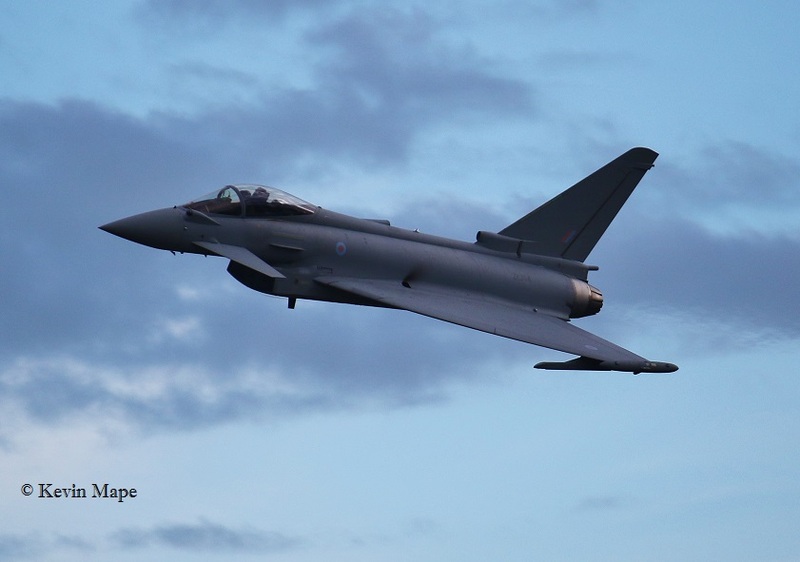 ZJ805/BD/29(R)Sqn/Typhoon T3 c/s “Triplex 91” – Ground abort. XX230/100Sqn/Hawk T1 c/s “*****” – Overshoot. ZK354/Unmarked – f/n without marks. 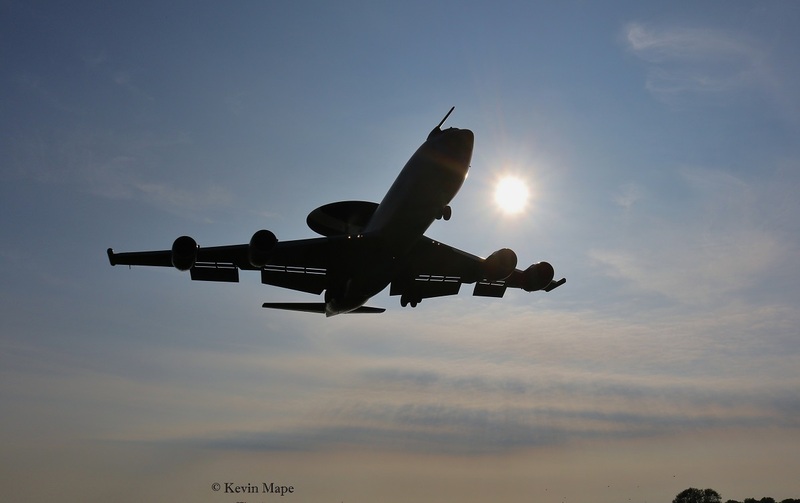 ZH102/02/8Sqn/Sentry AEW1 c/s “NATO 35” – Departed. G-BGCO/Bae Warton/PA-44 c/s “Golf Charlie Oscar” – Parked on Sierra. G-MAJH/JH/Eastern/Jetstream 41 c/s “East flt 101” in “102” out. 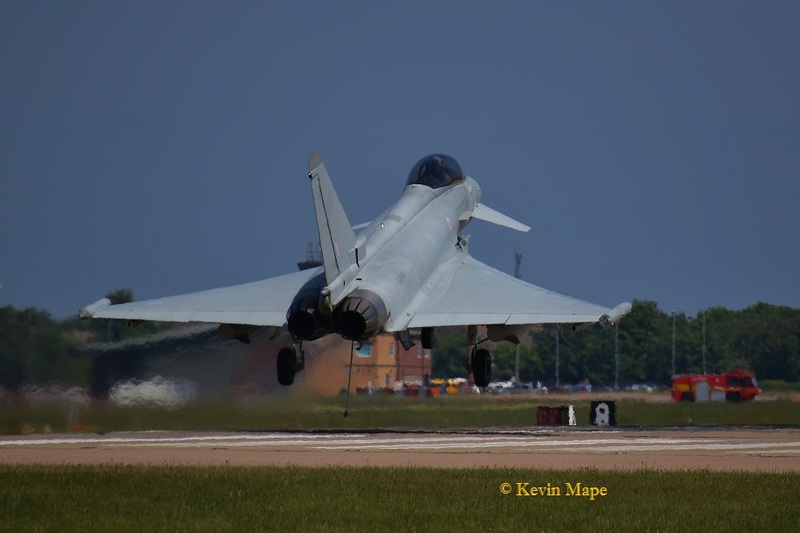 ZK322/GS/Unmarked/Typhoon FGR4 c/s “Zenith 23” – Ground abort. ZJ812/BK/29(R)Sqn/Typhoon T3 c/s “Cobra 42” – Ground abort. G-ALWB/Chipmunk 22 c/s “Golf Whisky Bravo” – Parked on Sierra. No.103/YT/EAT00.319/Xingu c/s “Cotam 1718” – Parked on Sierra. No.092/YL/EAT00.319/Xingu c/s “Cotam 1743” – Parked on Sierra. P7350/EB-G/BBMF/Spitfire IIa c/s “Spitfire 01” – Display. ZJ944/Unmarked/Typhoon FGR4 c/s “Typhoon 10” – Came back on a PAN and took the RHAG. 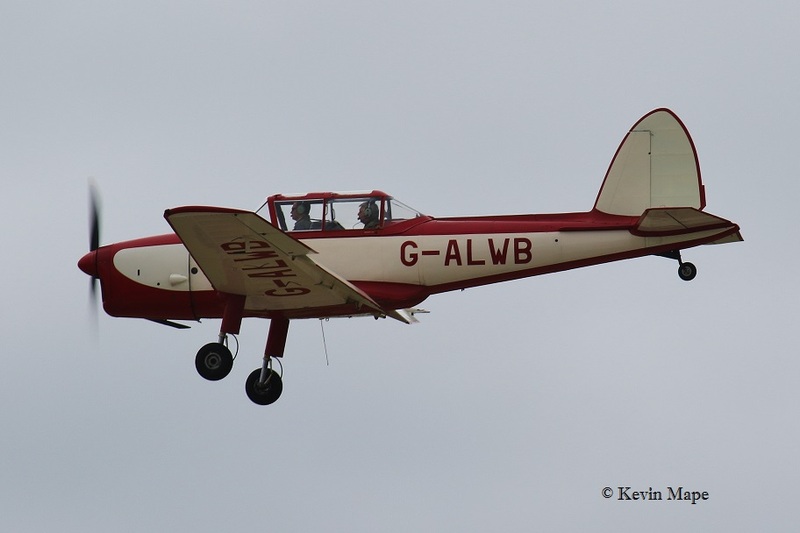 G-ALWB/Chipmunk 22 c/s “Golf Whisky Bravo” – Departed. No.103/YT/EAT00.319/Xingu c/s “Cotam 1718” – Departed. No.092/YL/EAT00.319/Xingu c/s “Cotam 1743” – Departed. ZJ211/Apache AH1 c/s “Hunter 1” – Overfly. ZJ181/Apache AH1 c/s “Hunter 2” – Overfly. 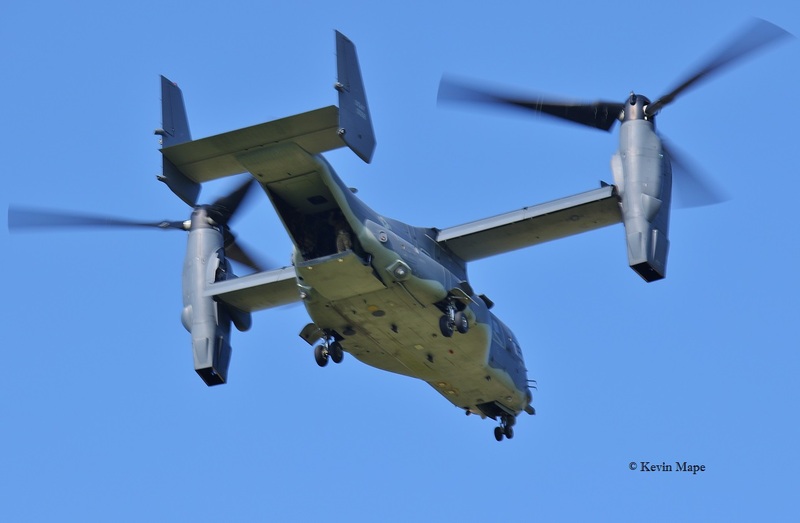 11-0058/7SOS/CV-22B Osprey c/s “Knife 71” – Touch & go. 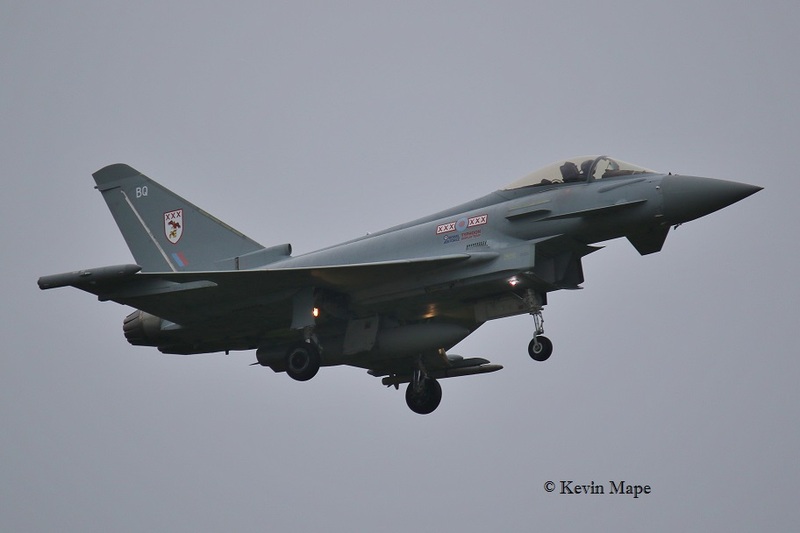 ZK341/Unmarked/Typhoon FGR4 – Towed from Echo to TMF. 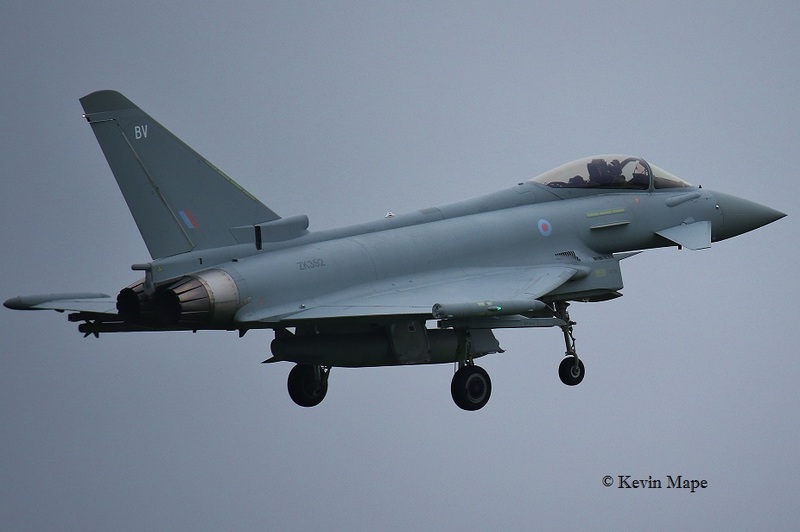 ZK369/Unmarked/Typhoon FGR4 – Towed from Echo to TMF. (TMF) – ZK312/EM/6Sqn/Typhoon FGR4 – Engine runs. 10th Fri Log thanks to Garf. AB910/SH-F/BBMF/SpitfireLF. 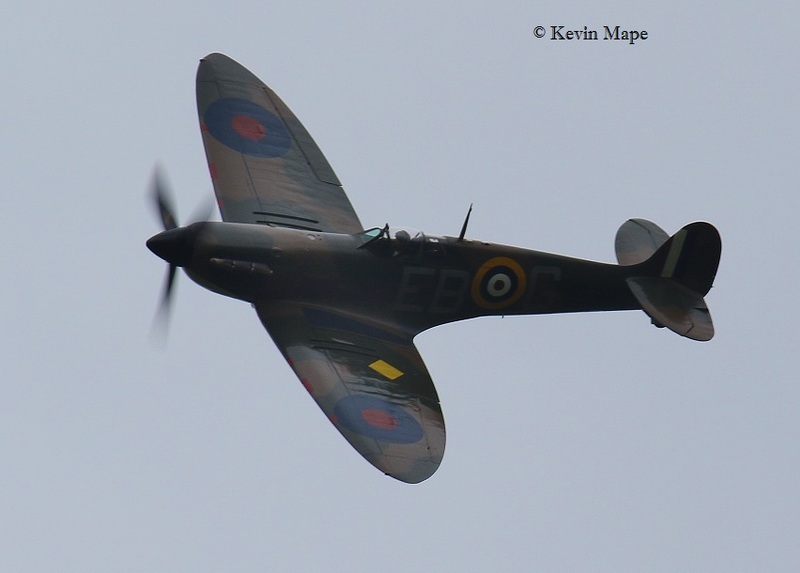 Vb c/s “Spitfire 90” – To Holland. GZ100/32(TR)Sqn/Agusta A-109 SP c/s “Ascot 1292” – Parked on the ASP. 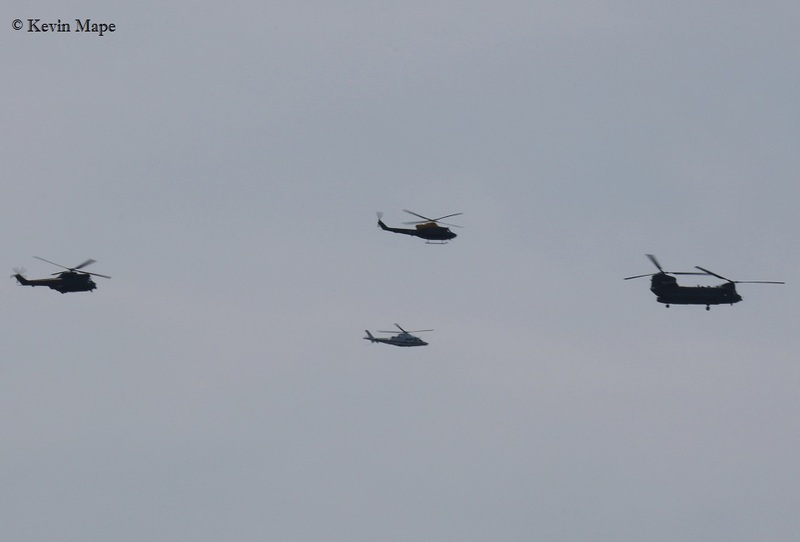 GZ100/32(TR)Sqn/Agusta A-109 SP c/s “Ascot 1292” – Departed. G-FRAP/AP/Cobham /Falcon 20EW c/s “Rushton 90” – Repair crew for G-FRAL. 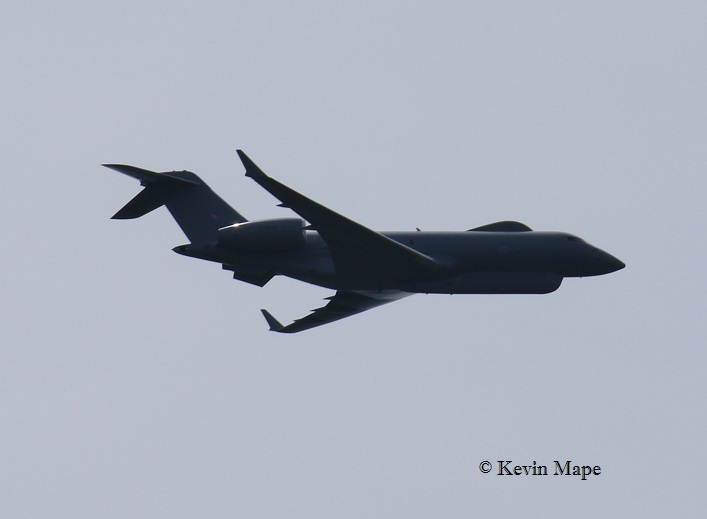 G-FRAL/AL/Cobham /Falcon 20EW c/s “Rushton 94” – Departed. ZK319/Y/II(AC)Sqn – Noted on tow to Hangar 2. ZJ946/Unmarked – Wash pan to TMF. 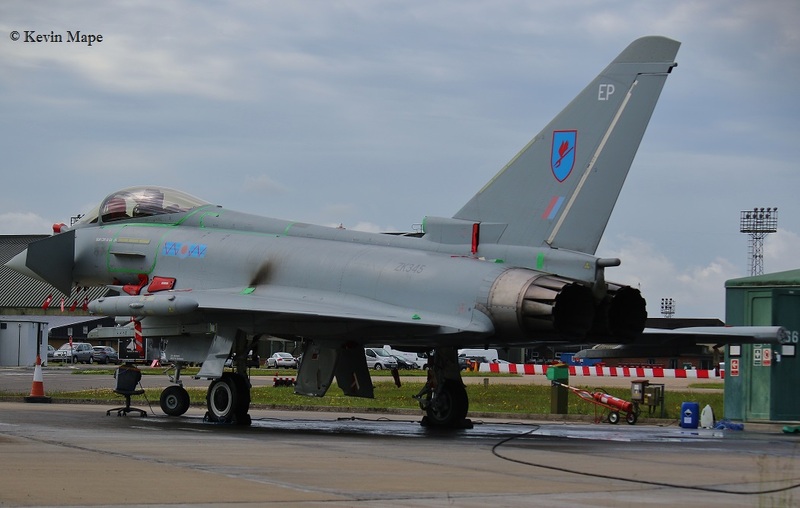 ZJ929/DL/XI(F)Sqn/Typhoon FGR4 – Noted on the Wash pan. ZG775/EB-Z/41(R)TES/Tornado GR4 c/s “Rebel **” . XX230/CM/100Sqn/Hawk T1A c/s “Capture” – Departed. 14th Tue Log thanks to Steve & Val. 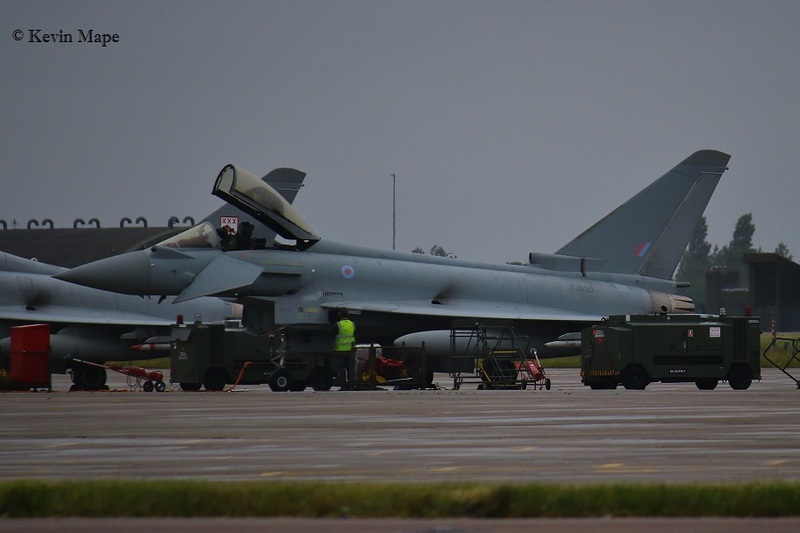 ZJ944/Unmarked/Typhoon FGR4 – noted outside TMF. XX230/CM/100Sqn/Hawk T1 c/s “Pirate 10” – Departed. 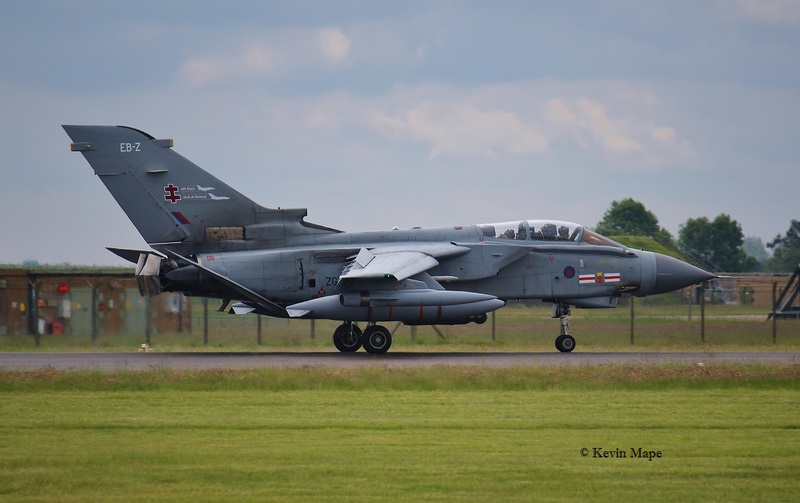 ZG775/EB-Z/41(R)TES/Tornado GR4 c/s “Marham 32” – Landed. 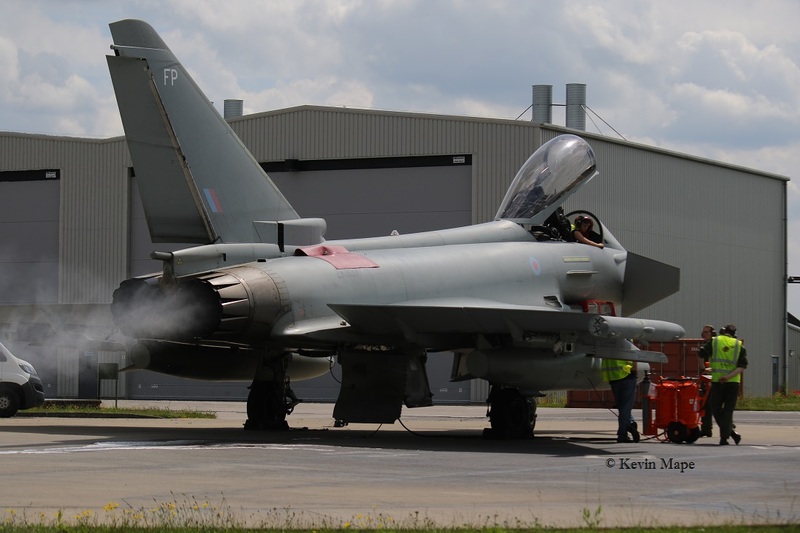 ZK312/EM/6Sqn/Typhoon FGR4 – Towed from Spray shop to TMF. 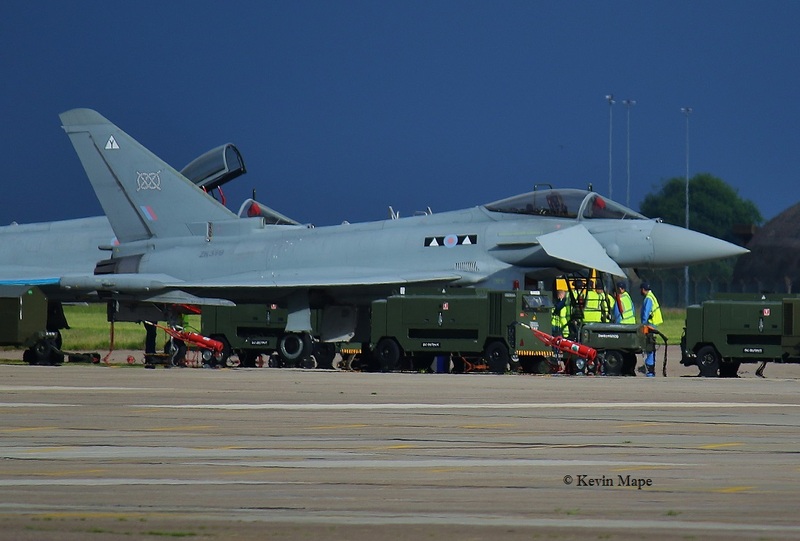 ZK301/Unmarked/Typhoon FGR4 c/s “Typhoon 16” – This Chute fell out onto the runway on take off. G-MAJH/JH/Eastern/ Jetstream 41 c/s “east Flt 104” in “105” out. 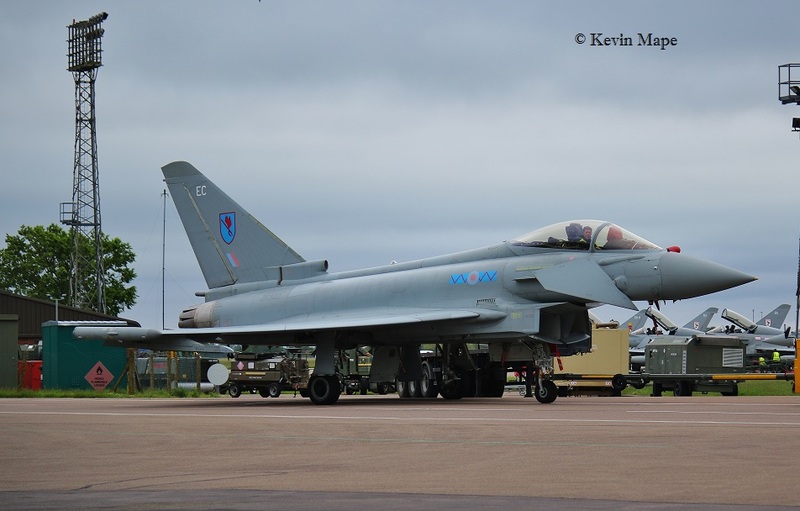 ZJ801/BJ/29(R)Sqn/Typhoon T3 – Towed into TMF. P7350/EB-G/BBMF/Spitfire IIa c/s “Spitfire 90” – Display. 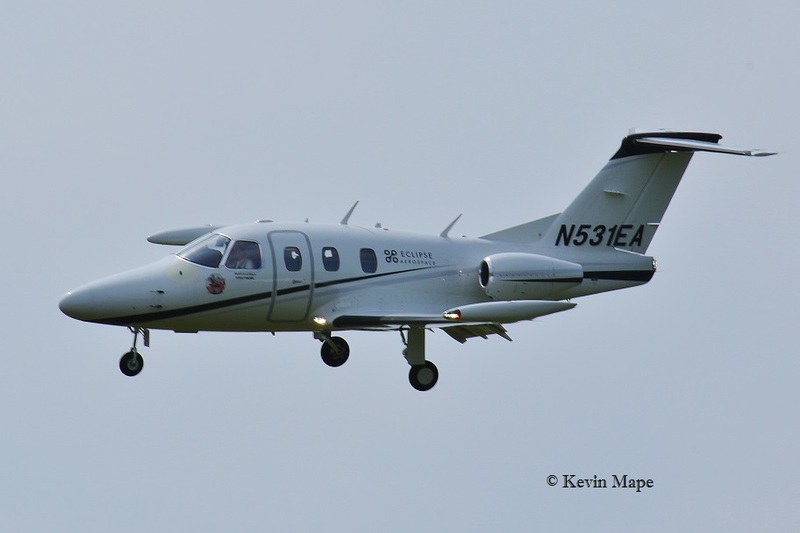 G-FRAR/AR/Cobham/Falcon 20 EW c/s “Zodiac 51” – Landed. 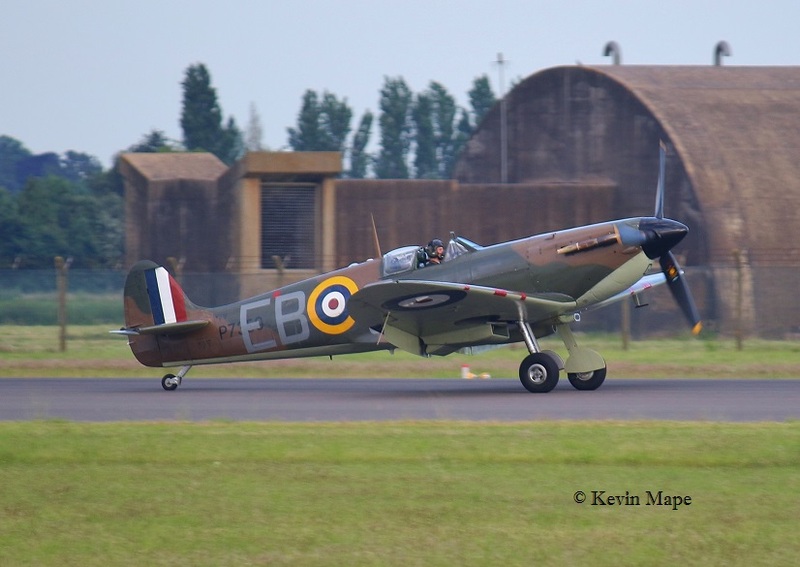 AB910/SH-F/BBMF/Spitfire Vb c/s “Spitfire 92” – Landed. ZJ946/Unmarked/Typhoon FGR4 c/s “Ascot 9621 Flight” To Akotiri Cyprus. XX321/CD/100Sqn/Hawk T1A c/s “Capture 2” – Departed. G-MAJH/JH/Eastern/Jetstream 41 c/s “East Flt 102” in “104” out. ZK308/BW/29(R)Sqn/Typhoon FGR4 – Towed into Left side of Paint shop. 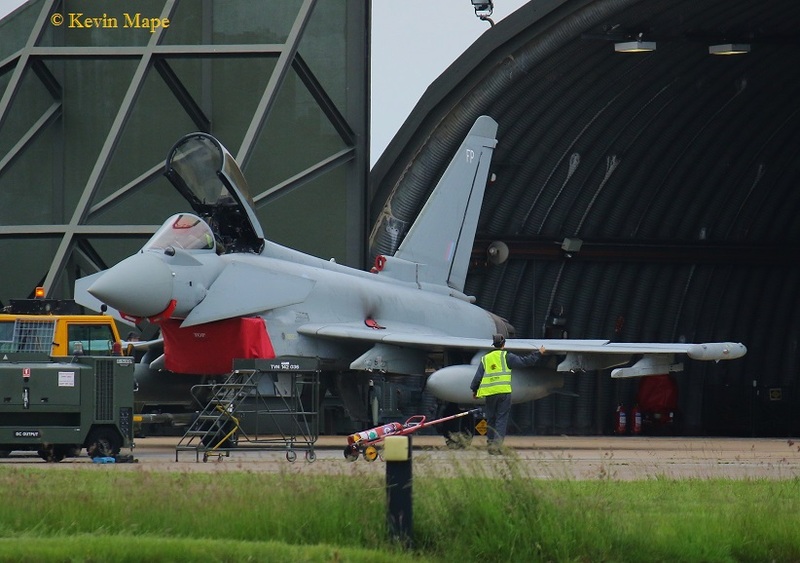 ZJ950/C/1435 Flt/Typhoon FGR4 – Towed into Right side of Paint shop. Night flying Log thanks to Susie,Tim & Kim Poppa. P7350/EB-G/BBMF/Spitfire IIa c/s “Spitfire 92” – Display. 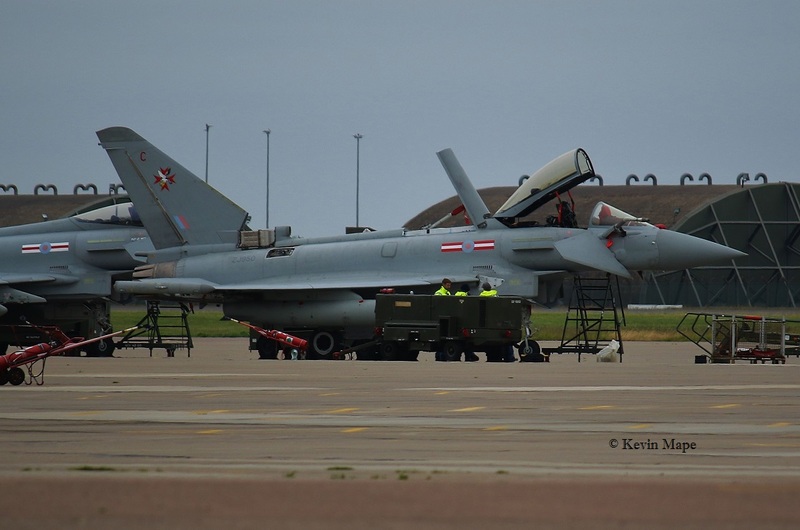 ZK312/EM/6Sqn/Typhoon FGR4 – Towed from the paint shop to TMF. ZK352/BV/Unmarked/Typhoon FGR4 c/s “Triplex 1” – Ground abort. 20th Mon Heavy rain up to mid afternoon. 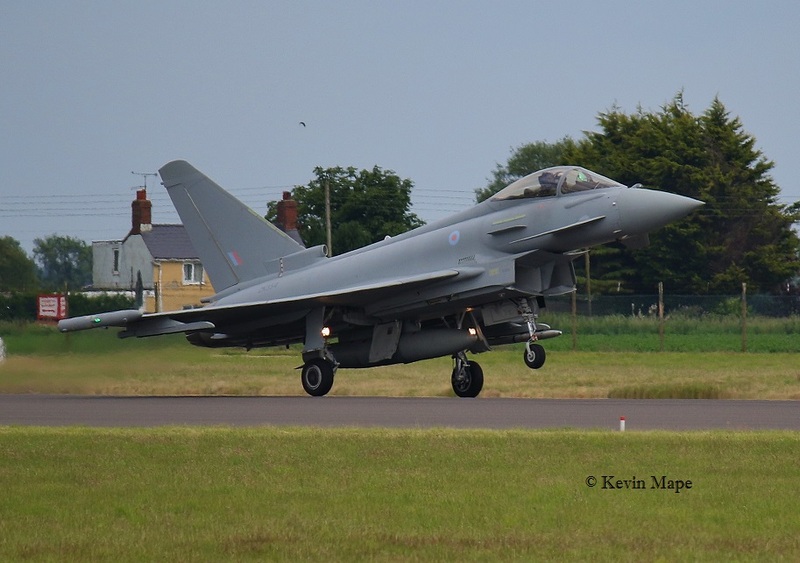 ZK337/FP/Unmarked/Typhoon FGR4 – Towed from Echo to the Wash pan – APU runs. 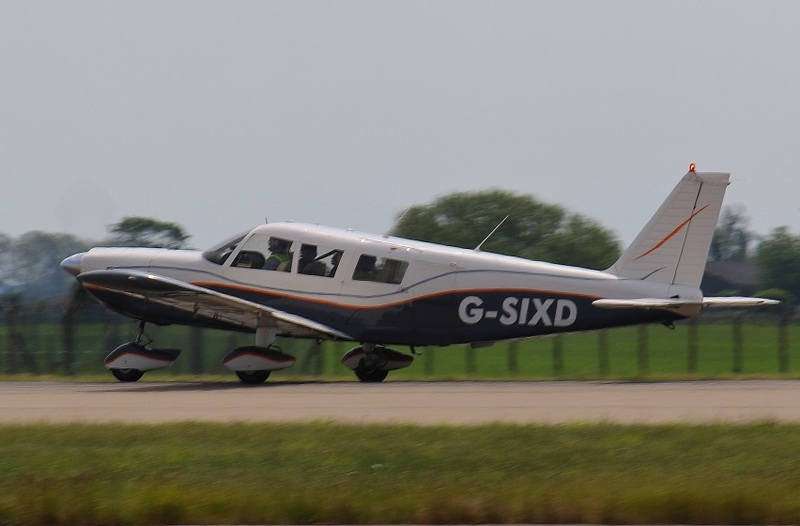 G-BYVO/VO/3FTS/Tutor T1 c/s “Cranwell 90” – Overshoot. ZG775/EB-Z/41(R)TES/Tornado GR4 c/s “Rebel 88” – Brimstone. ZK344/Unmarked/Typhoon FGR4 c/s “Typhoon 81” – Delivery to Lossiemouth. 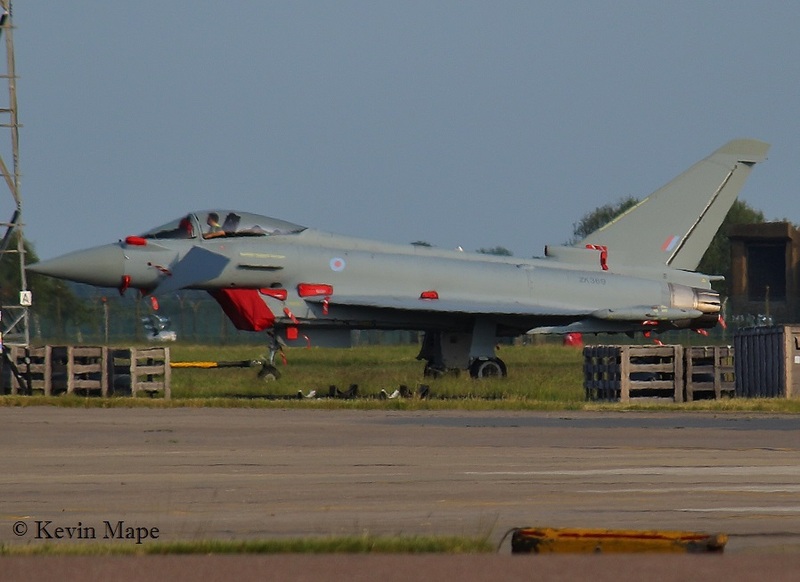 ZJ931/DA/XI(F)Sqn/Typhoon FGR4 – Towed from HAS 2 back to 11Sqn. ZK337/FP/Unmarked – Towed back to Echo. 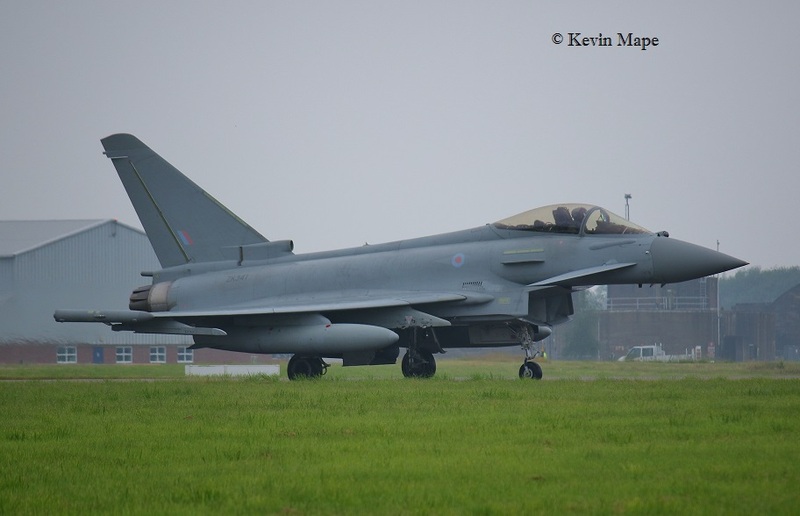 ZJ805/BD/29(R)Sqn/Typhoon T3 c/s “Triplex 21” Took a bird stike on take off and used shoot on landing. ZK325/FK/1(F)Sqn/Typhoon FGR4 c/s “Cobra 43” – Came from Foxtrot. 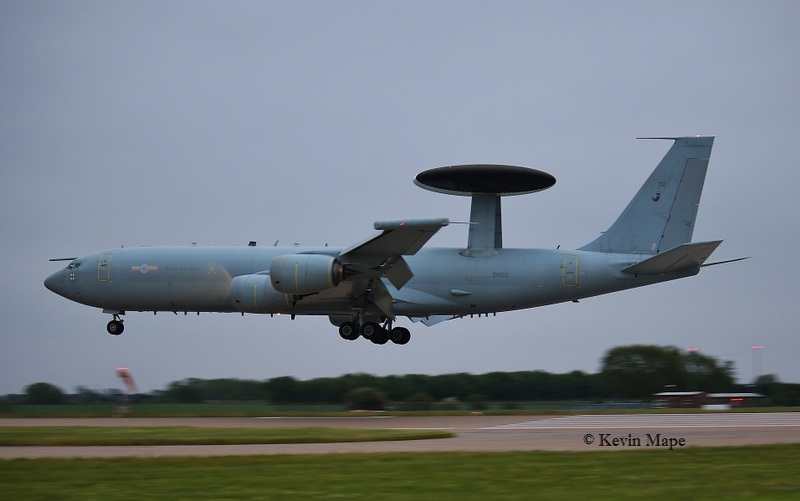 ZH101/01/8Sqn/Sentry AEW1 c/s “Solex 02” – Departed. ZK325/FK/1(F)Sqn/Typhoon FGR4 c/s “Triplex 71” – Came from Foxtrot. ZK313/Unmarked/Typhoon FGR4 c/s “Zircon 21” – To Stanta Range. 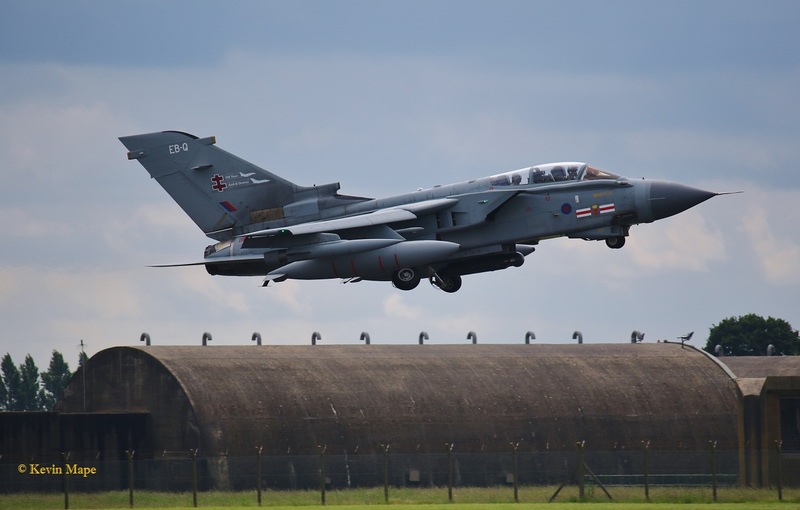 ZA553/045/Unmarked/Tornado GR4 c/s “Marham 67” – Overshoot. 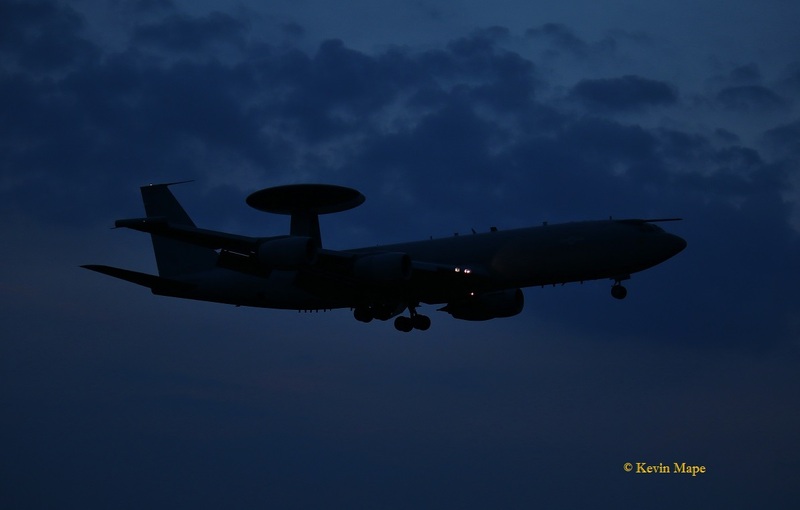 ZH101/01/8Sqn/Sentry AEW1 c/s “Solex 02” – Landed. ZK354/Unmarked/Typhoon FGR4 c/s “Typhoon 35” – Display. No.098/YO/EAT00.319/Xingu c/s “Cotam 1735” – Parked on Sierra . 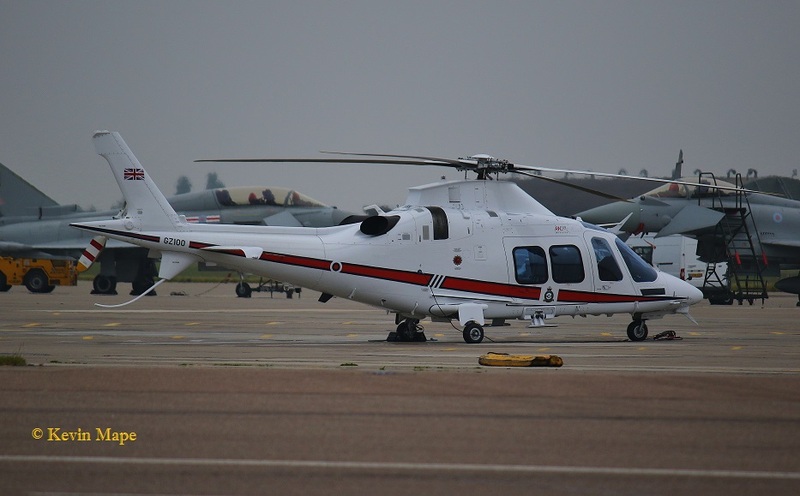 GZ100/32(TR)Sqn/AW-109 Spirit c/s “Ascot 1305” – Parked on the ASP. No.084/YH/EAT00.319/Xingu c/s “Cotam 1716” – Parked on Sierra . PM – Thanks to Susie Matson, Kim & Tim Poppa. LF363/JX-B/BBMF/Hurricane IIc c/s “Hurricane **” – Display. 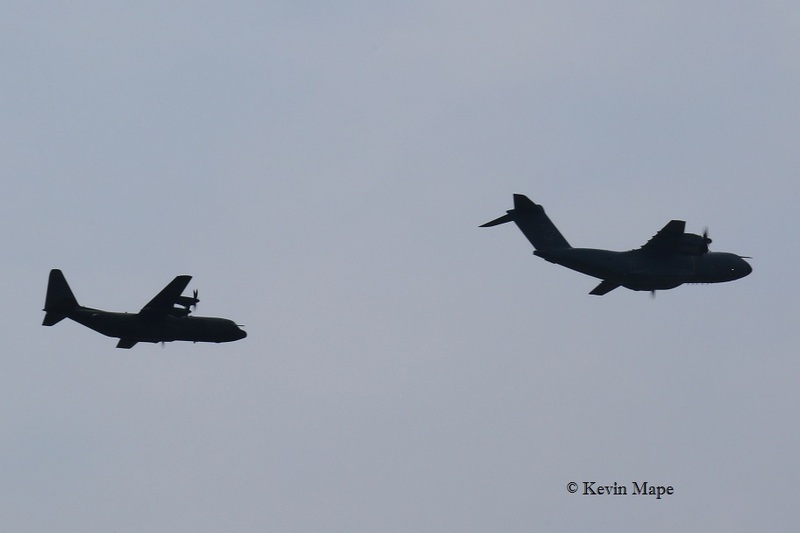 ZM407/A400 Atlas c/s “Gauntlet 69” – Overshoots. 16-40pm. G-MAJH/JH/Eastern /Jetstream 41 c/s “East flt 102” in “103” out. G-LINZ/R-44 c/s “Pipeline 88” – Overfly. 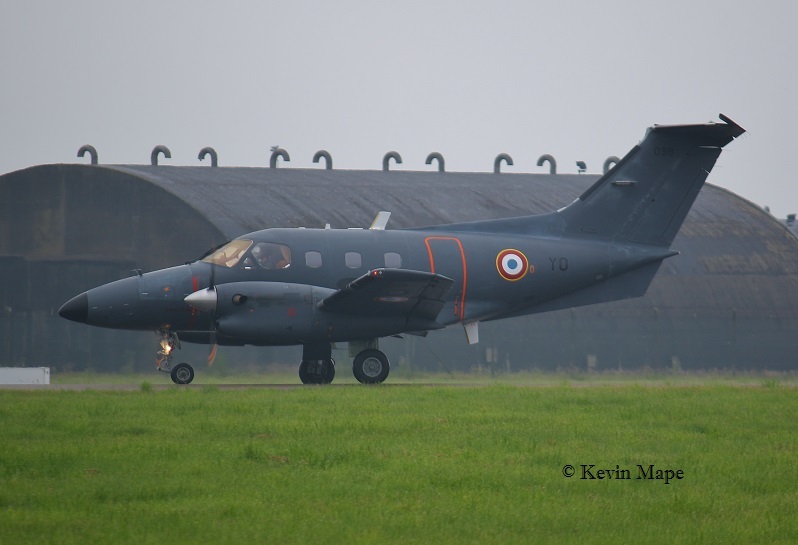 XX189/CR/100Sqn/Hawk T1 c/s “Pirate 11” – Departed on mission then returned. XX201/CQ/100Sqn/Hawk T1 c/s “Pirate 21” – Parked on Sierra. G-MAJH/JH/Eastern /Jetstream 41 c/s “East flt 104” in “105” out. 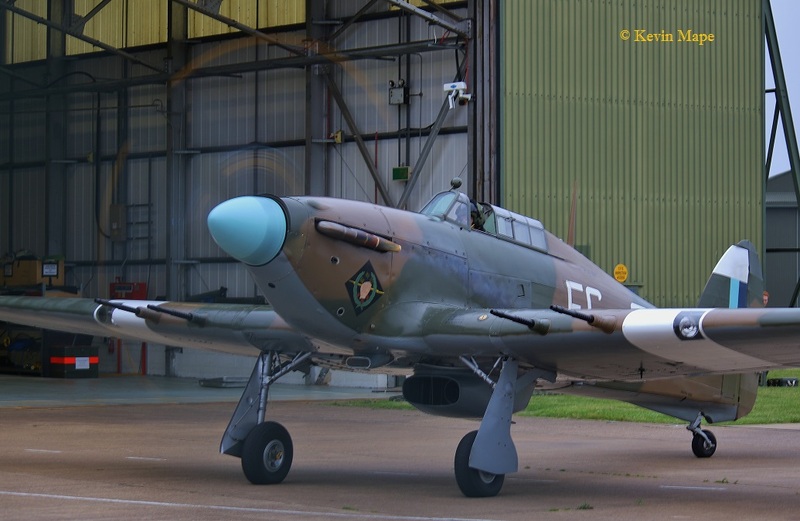 TE311//BBMF/Spitfire LF XVIe c/s “Rafair 7003” – Returned from Florennes. ASP – 8Sqn – ZH101,ZH104. 28th Tue Log thanks to Susie Matson. G-MAJH/JH/Eastern /Jetstream 41 c/s “East flt 101” in “102” out. QQ101/QiniteQ-ETPS/BAE 146 – RJ100 c/s “Tutor 80” – Parked on Sierra. ZK354/Unmarked/Typhoon FGR4 c/s “Cobra 31” – ground abort. 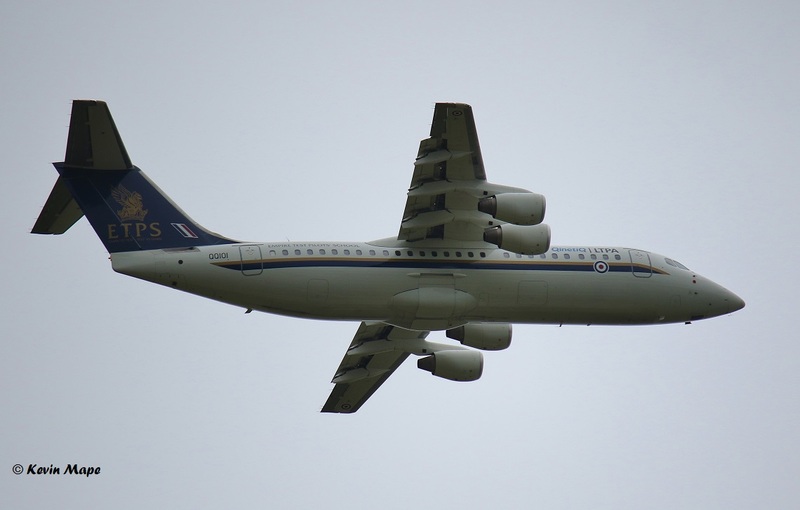 QQ101/QiniteQ-ETPS/BAE 146 – RJ100 c/s “Tutor 80” – Departed. 98-0132/LN rd/48FW/F-15E c/s “*******” – Overshoots. ZF135/135/1FTS/Tucano T1 c/s “Cranwell 21” – Parked on Sierra. ZF264/264/1FTS/Tucano T1 c/s “Cordite 1” – Parked on Sierra. ZF338/338/1FTS/Tucano T1 c/s “Cordite 2” – Parked on Sierra. 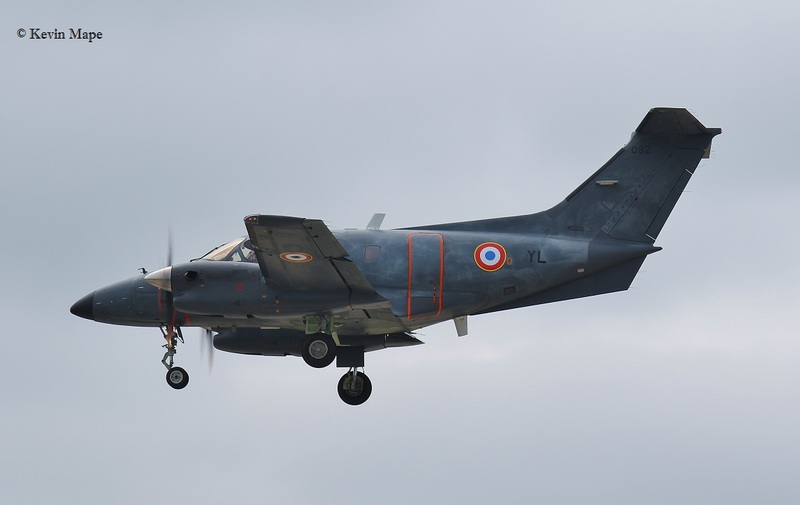 ZF264/264/1FTS/Tucano T1 c/s “Cordite 1” – Departed. 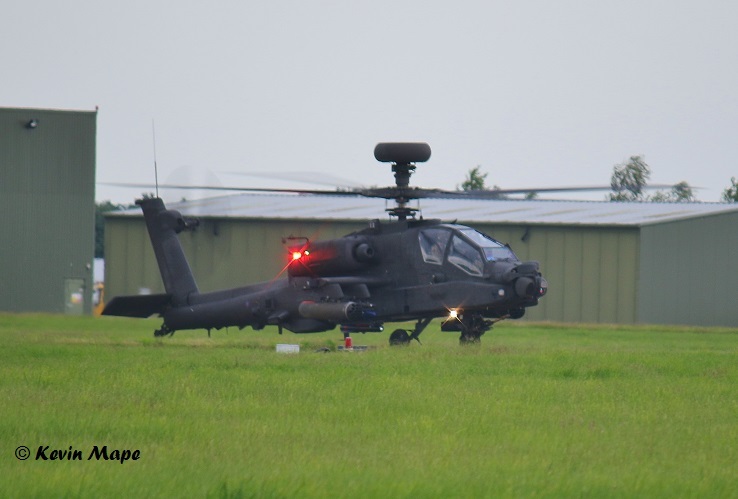 ZJ192/3Reg/AH-64D c/s “Army Air 320” – Fuel stop. QQ101/QiniteQ-ETPS/BAE 146 – RJ100 c/s “Gauntlet 76” – Parked on Sierra. 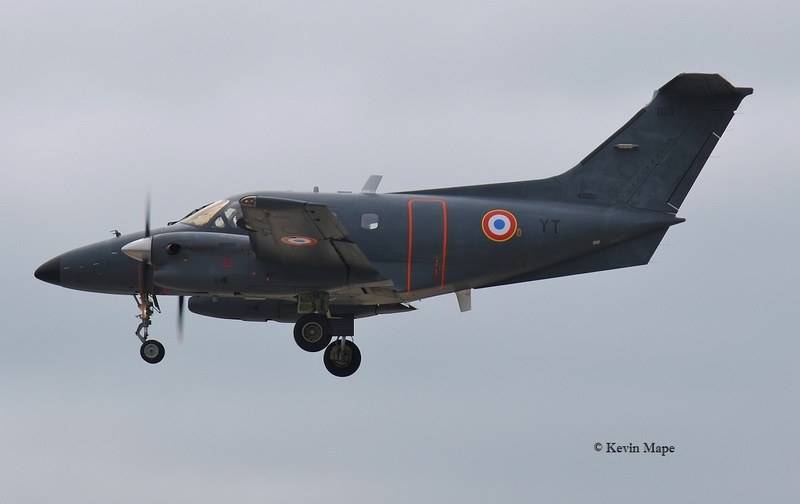 ZH873/47Sqn/ Hertcules C4 c/s “Ascot 309” – Parked on the cross runway – Departed..
29th Wed Log from 11am – 2pm Thanks to Susie Matson. XX201/CQ/100Sqn/Hawk T1A c/s “Pirate 2” – Parked on Sierra. XX321/CI/100Sqn/Hawk T1A c/s “******” – Parked on Sierra. 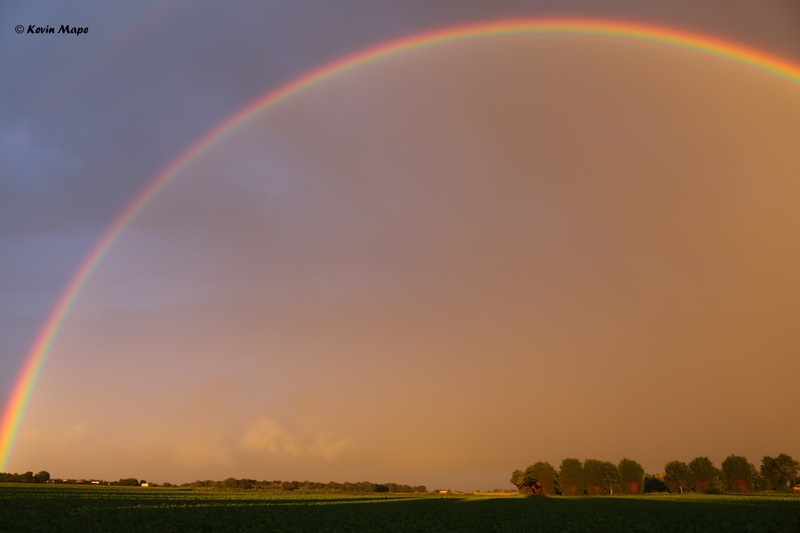 RAF Coningsby Rainbow – 9-00 pm. 30th Thur Log thanks to Rich. Typhoon FGR4 :- ZK335/EB-B,ZK339/ EB-E,ZJ947/EB-L,ZK315/sp,ZK321/EB-R. Noted in the TMF this month. 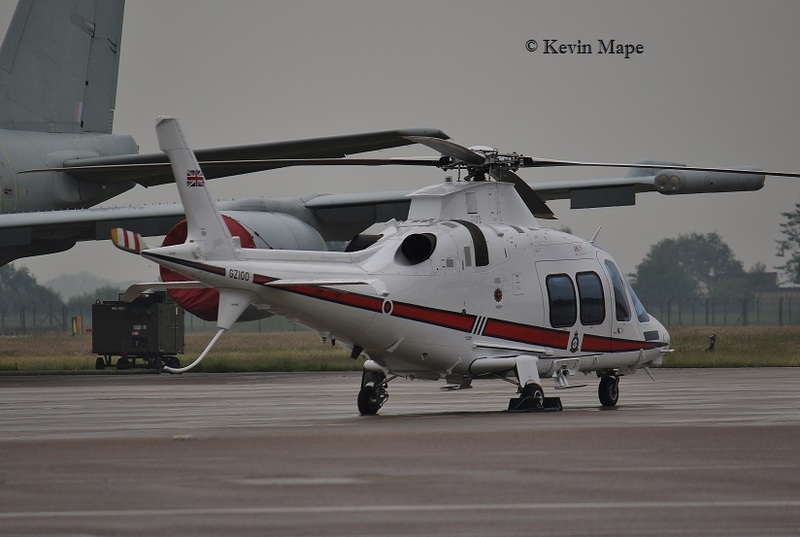 1st – ZK319/Y/II(AC)Sqn – Arrived. 1st–ZK381/EX /6Sqn- Taxi test run. 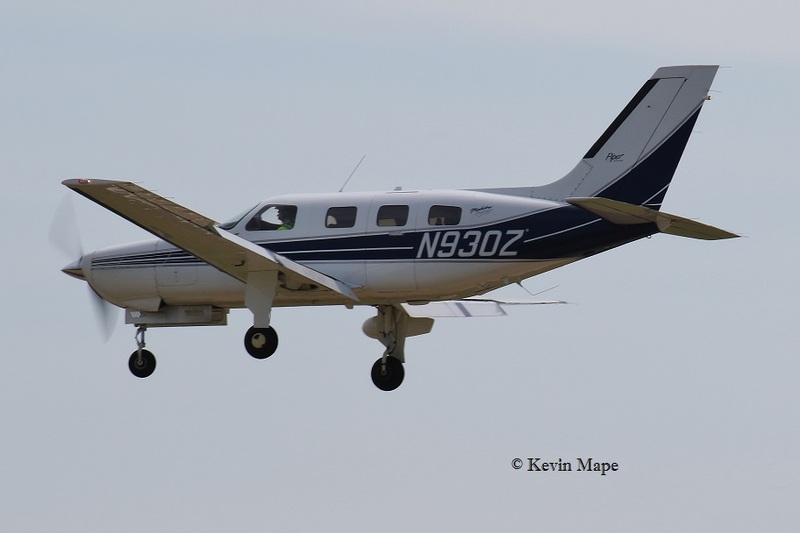 2nd– ZJ950/C/1435Flt – Noted on the ASP. 3rd –ZK302/EC/6Sqn – Towed from Paint shop to TMF. 3rd – ZK365/Unmarked – Noted on the ASP. 6th –ZK301/Unmarked – Noted on the ASP. 6th– ZK302/EC/6Sqn – Noted on the ASP. 6th–ZK305/EE/6Sqn – Noted on the ASP. 7th–ZK305 EE/6Sqn – Noted on the ASP. 7th–ZK345 EP/6Sqn – Noted on the ASP. 8th–ZK354/Unmarked- noted on the ASP. 8th–ZK344/Unmarked -Towed out of the Paint shop. 9th–ZK312 EM/6Sqn- Noted on the ASP. 9th–ZK369/Unmarked – Towed from south to north side. 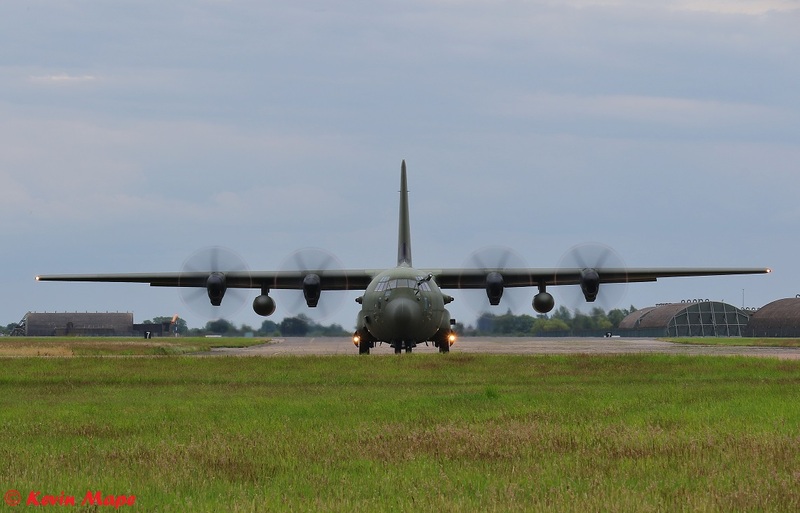 14th–ZJ801/BJ/29(R)Sqn – Towed into TMF. 14th–ZK354/Unmarked – Flying with 29(R)Sqn. 16th–ZJ950 C/1435 Flt – Towed into the Paint shop. 17th–ZK312 EM/6Sqn – Towed from the Paint shop to the TMF. 17th–ZK381 EX/6Sqn – Flying with 29(R)Sqn.